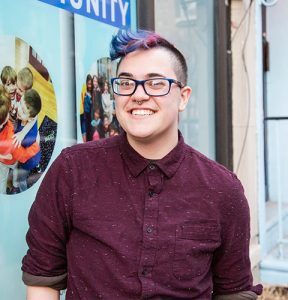 Beverly is an innovative and passionate Jewish educational leader who believes that each person constructs meaning in his or her life based on his or her experiences. Makom Community is built around creating learning experiences for families and children that are both joyous and meaningful. Beverly received a B.A. in Jewish Studies from the University of Maryland (UMD). While she was at UMD, she researched Israeli Education at Israel’s National Library in Jerusalem and the Tel Aviv Education Archives on an Isadore and Bertha Gudelsky Scholarship for Research in Israel. Beverly was also a fellow at Yeshivat Hadar, an egalitarian yeshiva in New York City. Beverly received her M.S.Ed. from the University of Pennsylvania in Jewish Education. In the last ten years directing synagogue schools at Congregation Shaare Tikvah in Upper Marlboro, MD and Temple Beth Sholom in Cherry Hill, NJ, and working at Barrack Hebrew Academy, Beverly has developed over forty new curricula for students and families of all ages. 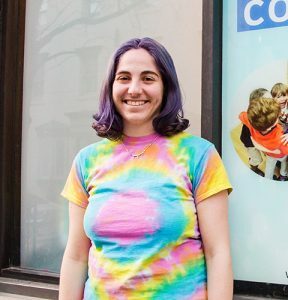 She is excited to build community with families here in Philadelphia to advance this new model of Jewish education for urban children and families that is taking root around the country in Berkeley, CA, Silver Spring, MD, Evanston, IL, Atlanta, GA. 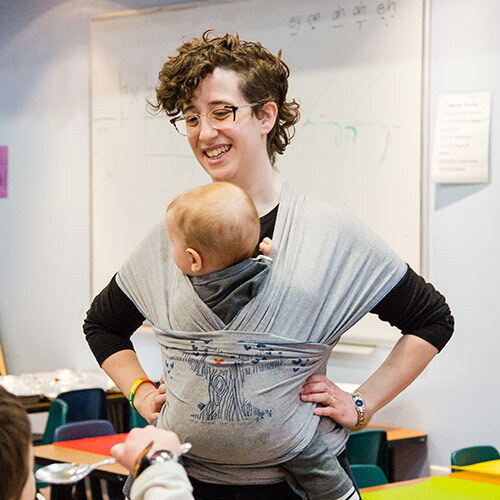 This new model meets the distinct needs of urban families and creates joyous, immersive, and effective Jewish education in a whole new way. Gaby is a musical and energetic Jewish educator who grew up in Central New Jersey. She studied psychology and linguistics at NYU and spent many happy summers at Habonim Dror summer camps. Gaby recently completed her M.Ed. from Weidner in Education. She loves dancing, baking intricate desserts, and making the world a more colorful place. She’s excited to have the opportunity to learn, sing, create, and giggle with our amazing students every day of the week! Wyatt was born and raised in the fine city of Philadelphia. He got a B.A. in musical theatre from Temple University. When Wyatt is not at Makom Community, he is creating new musicals with his theatre company The Hum’n’bards. Wyatt is also in training to teach the Alexander Technique so he can help people learn how to use their bodies and brains more effectively! Wyatt loves supporting the Makom Community kiddos in their Jewish learning pursuits, and filling Makom Community with theatre-magic and music!